Pre-heat the oven to 375°F. Lightly grease a 12-cup muffin pan. Add milk and almond extract and beat until combined. In a small bowl, whisk together 2 cups flour, baking powder, and salt. Add dry ingredients to butter mixture and stir to combine (do not beat or over-mix). Toss remaining 1 tablespoon flour with strawberries. Set aside 1/2 cup strawberries for topping. Gently fold remaining strawberries and almonds into batter. Divide batter evenly among muffins cups. Sprinkle tops with the 1/2 cup strawberries and turbinado sugar. Cool muffins in the pan on a rack for about 5 minutes. Remove muffins from the pan and cool on a rack. You may need to run a knife around the edge of the muffins to release them from the pan. 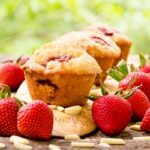 Strawberry Almond Muffins are packed with sweet berries and have a light nutty flavor. They are delightful for breakfast, brunch, or an afternoon snack.